Rail Sparrow/2FV hose is used as a flexible connection in compressed air braking systems on railway carriages and locomotives. It has a patented structure that meets the requirements of the new edition of Trenitalia Technical Specification n° 373407 esp. 06, issued in the beginning of 2018. The specification acknowledged the international regulatory changes that IVG’s technicians were already familiar with after developing a hose and hose assemblies in accordance with the new standards and technical specifications. The Trenitalia specification proposed two important challenges to the hose. The first: to meet fire behavior requirements of EN 45545-2, in the highest risk levels (HL2 and HL3) for use inside and outside the trains (R22 and R23). The second: the hose assemblies must also meet requirements of EN 50553, the so-called Running Capability. The products must pass a flame test according to ISO 15540 which means the hose must resist a flame at 800°C for 15 minutes. The Rail Sparrow/2FV hose has been certified by external bodies in accordance with the aforementioned regulations and deemed compliant by an Independent Safety Valuator (V.I.S.) which has approved its full compliance with the 6th version of Trenitalia Technical Specification. IVG Colbachini's R&D team has worked for a long time to design a hose with these technical characteristics. The innovative structure that we first presented to the market is configured as safe, stable and reliable. The hose guarantees full compliance with the EN 50553 standard without the addition of a silicone fireproof outer sleeve could potentially move during use, putting at risk the product's compliance with Running Capability, as well as maintaining its integrity over time. Moreover, the structure facilitates the operators in the assembly operations as it lacks external mobile protections. 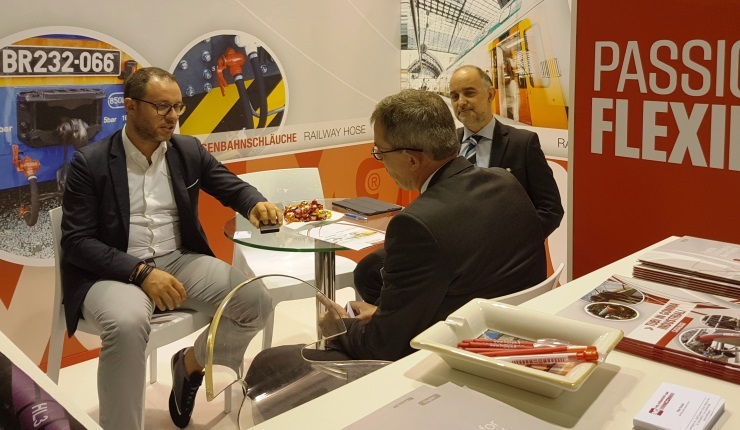 Choosing the right partner for rubber hoses is not easy, especially when your company operates in the railway sector. You must turn to an experienced supplier who has products certified in accordance with the most recent railway regulations. Halogen free hoses, installed in passenger and freight cars that require maximum safety in the event of a fire with characteristics of very low toxicity and emission of fumes.